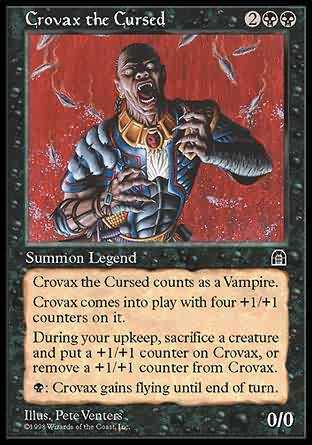 Crovax the Cursed counts as a Vampire. Crovax comes into play with four +1/+1 counters on it. During your upkeep, sacrifice a creature and put a +1/+1 counter on Crovax, or remove a +1/+1 counter from Crovax. Crovax the Cursed comes into play with four +1/+1 counters on it.